Three more Magic Towns have been added to the list: Chignahuapan and Cholula (both in the state of Puebla) and Pinos (Zacatecas). The new additions mean that Puebla now has five Magic Towns and Zacatecas has four. Chignahuapan is a town of some 20,000 inhabitants set in the beautiful mountainous landscape of the Sierra Norte in the state of Puebla, very close to Zacatlán, also a Magic Town. Chignahuapan sits at an elevation of 2,290 meters above sea level, only 8 kilometers from an impressive 200-meter-high waterfall, the Salto de Quetzalapa, and several thermal spas. The town has several historic buildings, including the main church which dates back to the sixteenth century and has colorful wall decorations. Inside are several alterpieces and a monument showing St. James astride his horse. A short distance away a modern church, the Church of the Immaculate Conception, houses an amazing wooden sculpture of the Virgin Mary, almost 12 meters in height, reputed to be the largest interior sculpture of its kind in Latin America. A third church, the Iglesia del Honguito in the Ixtlahuaca quarter of town, was built in honor of one of the most unusual religious items in Mexico: a tiny petrified mushroom, found in 1880, which according to believers embodies several religious images. 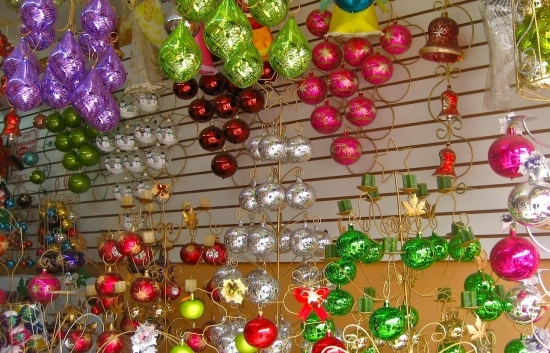 Chignahuapan is one of the most important towns in Mexico for the manufacture of glass Christmas ornaments. Some 200 workshops in the town produce more than 70 million blown-glass ornaments a year, 20% of them for export. 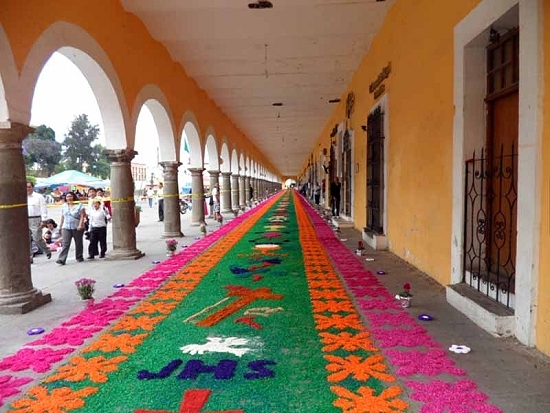 Portales in Cholula decorated for fiesta. Credit: Turismo Puebla. Cholula is a delightful city of around 80,000 inhabitants located 22 kilometers west of the city of Puebla, and now virtually contiguous with it. Founded in 1557, Cholula has numerous buildings of historic and architectural importance. The city is said to have as many churches as days in the year. Perhaps the most famous church is the one perched on top of one of, if not the, largest pyramids in Mexico. Tunnels into the pyramid, which was originally dedicated to the featherd serpent Quetzalcóatl, allow visitors to walk through the hill beneath the church. This church on top of a pyramid is often used as a symbol of how Catholic religion was superimposed on existing beliefs. Cholula’s massive central plaza is one of the largest in Latin America. The city is home to the main campus of the University of the Americas and is well worthy of its Magic Town designation. This former gold and silver mining town, often called Real de Pinos, was founded in 1594 relatively close to the Camino Real that linked Mexico City to Santa Fe, and approximately equidistant from the cities of Zacatecas, Aguascalientes and San Luis Potosí. Pinos (Pines), in the Sierra de Pinos at an elevation of 2700 meters above sea level, now has about 8,000 inhabitants. The attractive town has several historic buildings, including the San Francisco convent with its beautifully restored patio and 17th century decorations, and the church of San Matías, with fine stonework, which dates back to the same period. Pinos is the fourth Magic Town in Zacatecas, joining Sombrerete, Teúl de González Ortega and Jerez.